Arizona’s new immigration law• Prohibits state, city or county officials from limiting or restricting “the enforcement of federal immigration laws to less than the full extent permitted by federal law” and allows an Arizona resident to sue an official or agency that adopts or implements a policy that does so. The bill contains a “loser pays” provision meant to deter frivolous lawsuits. • Allows law-enforcement officials to arrest a person without a warrant if they have probable cause to believe the person has committed a public offense that makes him or her removable from the U.S.
AN ACT AMENDING TITLE 11, CHAPTER 7, ARIZONA REVISED STATUTES, BY ADDING ARTICLE 8; AMENDING TITLE 13, CHAPTER 15, ARIZONA REVISED STATUTES, BY ADDING SECTION 13-1509; AMENDING SECTION 13-2319, ARIZONA REVISED STATUTES; AMENDING TITLE 13, CHAPTER 29, ARIZONA REVISED STATUTES, BY ADDING SECTIONS 13-2928 AND 13-2929; AMENDING SECTIONS 23-212, 23-212.01, 23-214 AND 28-3511, ARIZONA REVISED STATUTES; AMENDING TITLE 41, CHAPTER 12, ARTICLE 2, ARIZONA REVISED STATUTES, BY ADDING SECTION 41-1724; RELATING TO UNLAWFULLY PRESENT ALIENS. 1.DETERMINING ELIGIBILITY FOR ANY PUBLIC BENEFIT, SERVICE OR LICENSE PROVIDED BY ANY FEDERAL, STATE, LOCAL OR OTHER POLITICAL SUBDIVISION OF THIS STATE. 4. IF THE PERSON IS AN ALIEN, DETERMINING WHETHER THE PERSON IS IN COMPLIANCE WITH THE FEDERAL REGISTRATION LAWS PRESCRIBED BY TITLE II, CHAPTER OF THE FEDERAL IMMIGRATION AND NATIONALITY ACT. I. A LAW ENFORCEMENT OFFICER IS INDEMNIFIED BY THE LAW ENFORCEMENT OFFICER’S AGENCY AGAINST REASONABLE COSTS AND EXPENSES, INCLUDING ATTORNEY FEES, INCURRED BY THE OFFICER IN CONNECTION WITH ANY ACTION, SUIT OR PROCEEDING BROUGHT PURSUANT TO THIS SECTION TO WHICH THE OFFICER MAY BE A PARTY BY REASON OF THE OFFICER BEING OR HAVING BEEN A MEMBER OF THE LAW ENFORCEMENT AGENCY, EXCEPT IN RELATION TO MATTERS IN WHICH THE OFFICER IS ADJUDGED TO HAVE ACTED IN BAD FAITH. J. THIS SECTION SHALL BE IMPLEMENTED IN A MANNER CONSISTENT WITH FEDERAL LAWS REGULATING IMMIGRATION, PROTECTING THE CIVIL RIGHTS OF ALL PERSONS AND RESPECTING THE PRIVILEGES AND IMMUNITIES OF UNITED STATES CITIZENS. GOVERNMENT TO VERIFY OR ASCERTAIN AN ALIEN’S IMMIGRATION STATUS. 2. A LAW ENFORCEMENT OFFICER OR AGENCY COMMUNICATING WITH THE UNITED STATES IMMIGRATION AND CUSTOMS ENFORCEMENT OR THE UNITED STATES BORDER PROTECTION PURSUANT TO 8 UNITED STATES CODE SECTION 1373(c). C. A PERSON WHO IS SENTENCED PURSUANT TO THIS SECTION IS NOT ELIGIBLE FOR SUSPENSION OR COMMUTATION OF SENTENCE OR RELEASE ON ANY BASIS UNTIL THE SENTENCE IMPOSED IS SERVED. (b) WITHIN SIXTY MONTHS BEFORE THE VIOLATION, HAS BEEN REMOVED FROM THE UNITED STATES PURSUANT TO 8 UNITED STATES CODE SECTION 1229a OR HAS ACCEPTED A VOLUNTARY REMOVAL FROM THE UNITED STATES PURSUANT TO 8 UNITED STATES CODE SECTION 1229c. E. NOTWITHSTANDING ANY OTHER LAW, A PEACE OFFICER MAY LAWFULLY STOP ANY PERSON WHO IS OPERATING A MOTOR VEHICLE IF THE OFFICER HAS REASONABLE SUSPICION TO BELIEVE THE PERSON IS IN VIOLATION OF ANY CIVIL TRAFFIC LAW AND THIS SECTION. 1. “Family member” means the person’s parent, grandparent, sibling or any other person who is related to the person by consanguinity or affinity to the second degree. 3. “Smuggling of human beings” means the transportation, procurement of transportation or use of property or real property by a person or an entity that knows or has reason to know that the person or persons transported or to be transported are not United States citizens, permanent resident aliens or persons otherwise lawfully in this state or have attempted to enter, entered or remained in the United States in violation of law. 1. “SOLICIT” MEANS VERBAL OR NONVERBAL COMMUNICATION BY A GESTURE OR A NOD THAT WOULD INDICATE TO A REASONABLE PERSON THAT A PERSON IS WILLING TO BE EMPLOYED. 2. “UNAUTHORIZED ALIEN” MEANS AN ALIEN WHO DOES NOT HAVE THE LEGAL RIGHT OR AUTHORIZATION UNDER FEDERAL LAW TO WORK IN THE UNITED STATES AS DESCRIBED IN 8 UNITED STATES CODE SECTION 1324a(h)(3). 13-2929. 1. TRANSPORT OR MOVE OR ATTEMPT TO TRANSPORT OR MOVE AN ALIEN IN THIS STATE IN A MEANS OF TRANSPORTATION IF THE PERSON KNOWS OR RECKLESSLY DISREGARDS THE FACT THAT THE ALIEN HAS COME TO, HAS ENTERED OR REMAINS IN THE UNITED STATES IN VIOLATION OF LAW. C. A PERSON WHO VIOLATES THIS SECTION IS GUILTY OF A CLASS 1 MISDEMEANOR AND IS SUBJECT TO A FINE OF AT LEAST ONE THOUSAND DOLLARS, EXCEPT THAT A VIOLATION OF THIS SECTION THAT INVOLVES TEN OR MORE ILLEGAL ALIENS IS A CLASS 6 FELONY AND THE PERSON IS SUBJECT TO A FINE OF AT LEAST ONE THOUSAND DOLLARS FOR EACH ALIEN WHO IS INVOLVED. B. The attorney general shall prescribe a complaint form for a person to allege a violation of subsection A of this section. The complainant shall not be required to list the complainant’s social security number on the complaint form or to have the complaint form notarized. On receipt of a complaint on a prescribed complaint form that an employer allegedly knowingly employs an unauthorized alien, the attorney general or county attorney shall investigate whether the employer has violated subsection A of this section. If a complaint is received but is not submitted on a prescribed complaint form, the attorney general or county attorney may investigate whether the employer has violated subsection A of this section. This subsection shall not be construed to prohibit the filing of anonymous complaints that are not submitted on a prescribed complaint form. The attorney general or county attorney shall not investigate complaints that are based solely on race, color or national origin. A complaint that is submitted to a county attorney shall be submitted to the county attorney in the county in which the alleged unauthorized alien is or was employed by the employer. The county sheriff or any other local law enforcement agency may assist in investigating a complaint. When investigating a complaint, the attorney general or county attorney shall verify the work authorization of the alleged unauthorized alien with the federal government pursuant to 8 United States Code section 1373(c). A state, county or local official shall not attempt to independently make a final determination on whether an alien is authorized to work in the United States. An alien’s immigration status or work authorization status shall be verified with the federal government pursuant to 8 United States Code section 1373(c). A person who knowingly files a false and frivolous complaint under this subsection is guilty of a class 3 misdemeanor. (c) Shall order the employer to file a signed sworn affidavit with the county attorney within three business days after the order is issued. The affidavit shall state that the employer has terminated the employment of all unauthorized aliens in this state and that the employer will not intentionally or knowingly employ an unauthorized alien in this state. The court shall order the appropriate agencies to suspend all licenses subject to this subdivision that are held by the employer if the employer fails to file a signed sworn affidavit with the county attorney within three business days after the order is issued. All licenses that are suspended under this subdivision shall remain suspended until the employer files a signed sworn affidavit with the county attorney. Notwithstanding any other law, on filing of the affidavit the suspended licenses shall be reinstated immediately by the appropriate agencies. For the purposes of this subdivision, the licenses that are subject to suspension under this subdivision are all licenses that are held by the employer specific to the business location where the unauthorized alien performed work. If the employer does not hold a license specific to the business location where the unauthorized alien performed work, but a license is necessary to operate the employer’s business in general, the licenses that are subject to suspension under this subdivision are all licenses that are held by the employer at the employer’s primary place of business. On receipt of the court’s order and notwithstanding any other law, the appropriate agencies shall suspend the licenses according to the court’s order. The court shall send a copy of the court’s order to the attorney general and the attorney general shall maintain the copy pursuant to subsection G of this section. 2. For a second violation, as described in paragraph 3 of this subsection, the court shall order the appropriate agencies to permanently revoke all licenses that are held by the employer specific to the business location where the unauthorized alien performed work. If the employer does not hold a license specific to the business location where the unauthorized alien performed work, but a license is necessary to operate the employer’s business in general, the court shall order the appropriate agencies to permanently revoke all licenses that are held by the employer at the employer’s primary place of business. On receipt of the order and notwithstanding any other law, the appropriate agencies shall immediately revoke the licenses. (a) A first violation by an employer at a business location if the violation did not occur during a probationary period ordered by the court under this subsection or section 23-212.01, subsection F for that employer’s business location. (b) A second violation by an employer at a business location if the violation occurred during a probationary period ordered by the court under this subsection or section 23-212.01, subsection F for that employer’s business location. G. The attorney general shall maintain copies of court orders that are received pursuant to subsection F of this section and shall maintain a database of the employers and business locations that have a first violation of subsection A of this section and make the court orders available on the attorney general’s website. H. On determining whether an employee is an unauthorized alien, the court shall consider only the federal government’s determination pursuant to 8 United States Code section 1373(c). The federal government’s determination creates a rebuttable presumption of the employee’s lawful status. The court may take judicial notice of the federal government’s determination and may request the federal government to provide automated or testimonial verification pursuant to 8 United States Code section 1373(c). B. The attorney general shall prescribe a complaint form for a person to allege a violation of subsection A of this section. The complainant shall not be required to list the complainant’s social security number on the complaint form or to have the complaint form notarized. On receipt of a complaint on a prescribed complaint form that an employer allegedly intentionally employs an unauthorized alien, the attorney general or county attorney shall investigate whether the employer has violated subsection A of this section. If a complaint is received but is not submitted on a prescribed complaint form, the attorney general or county attorney may investigate whether the employer has violated subsection A of this section. This subsection shall not be construed to prohibit the filing of anonymous complaints that are not submitted on a prescribed complaint form. The attorney general or county attorney shall not investigate complaints that are based solely on race, color or national origin. A complaint that is submitted to a county attorney shall be submitted to the county attorney in the county in which the alleged unauthorized alien is or was employed by the employer. The county sheriff or any other local law enforcement agency may assist in investigating a complaint. When investigating a complaint, the attorney general or county attorney shall verify the work authorization of the alleged unauthorized alien with the federal government pursuant to 8 United States Code section 1373(c). A state, county or local official shall not attempt to independently make a final determination on whether an alien is authorized to work in the United States. An alien’s immigration status or work authorization status shall be verified with the federal government pursuant to 8 United States Code section 1373(c). A person who knowingly files a false and frivolous complaint under this subsection is guilty of a class 3 misdemeanor. (b) Order the employer to be subject to a five year probationary period for the business location where the unauthorized alien performed work. During the probationary period the employer shall file quarterly reports in the form provided in section 23-722.01 with the county attorney of each new employee who is hired by the employer at the business location where the unauthorized alien performed work. (d) Order the employer to file a signed sworn affidavit with the county attorney. The affidavit shall state that the employer has terminated the employment of all unauthorized aliens in this state and that the employer will not intentionally or knowingly employ an unauthorized alien in this state. The court shall order the appropriate agencies to suspend all licenses subject to this subdivision that are held by the employer if the employer fails to file a signed sworn affidavit with the county attorney within three business days after the order is issued. All licenses that are suspended under this subdivision for failing to file a signed sworn affidavit shall remain suspended until the employer files a signed sworn affidavit with the county attorney. For the purposes of this subdivision, the licenses that are subject to suspension under this subdivision are all licenses that are held by the employer specific to the business location where the unauthorized alien performed work. If the employer does not hold a license specific to the business location where the unauthorized alien performed work, but a license is necessary to operate the employer’s business in general, the licenses that are subject to suspension under this subdivision are all licenses that are held by the employer at the employer’s primary place of business. On receipt of the court’s order and notwithstanding any other law, the appropriate agencies shall suspend the licenses according to the court’s order. The court shall send a copy of the court’s order to the attorney general and the attorney general shall maintain the copy pursuant to subsection G of this section. (a) A first violation by an employer at a business location if the violation did not occur during a probationary period ordered by the court under this subsection or section 23-212, subsection F for that employer’s business location. (b) A second violation by an employer at a business location if the violation occurred during a probationary period ordered by the court under this subsection or section 23-212, subsection F for that employer’s business location. EMPLOYEE’S EMPLOYMENT OR AT LEAST THREE YEARS, WHICHEVER IS LONGER. 1. “Economic development incentive” means any grant, loan or performance-based incentive from any government entity that is awarded after September 30, 2008. Economic development incentive does not include any tax provision under title 42 or 43. 2. “Government entity” means this state and any political subdivision of this state that receives and uses tax revenues. C. Every three months the attorney general shall request from the United States department of homeland security a list of employers from this state that are registered with the e-verify program. On receipt of the list of employers, the attorney general shall make the list available on the attorney general’s website. 1. The person’s driving privilege is suspended or revoked for any reason. 3. The person is subject to an ignition interlock device requirement pursuant to chapter 4 of this title and the person is operating a vehicle without a functioning certified ignition interlock device. This paragraph does not apply to a person operating an employer’s vehicle or the operation of a vehicle due to a substantial emergency as defined in section 28-1464. 4. THE PERSON IS IN VIOLATION OF A CRIMINAL OFFENSE AND IS TRANSPORTING, MOVING, CONCEALING, HARBORING OR SHIELDING OR ATTEMPTING TO TRANSPORT, MOVE, CONCEAL, HARBOR OR SHIELD AN ALIEN IN THIS STATE IN A VEHICLE IF THE PERSON KNOWS OR RECKLESSLY DISREGARDS THE FACT THAT THE ALIEN HAS COME TO, HAS ENTERED OR REMAINS IN THE UNITED STATES IN VIOLATION OF LAW. 1. The person’s driving privilege is canceled, suspended or revoked for any reason or the person has not ever been issued a driver license or permit by this state and the person does not produce evidence of ever having a driver license or permit issued by another jurisdiction. (c) Does not have any spirituous liquor in the spouse’s body if the spouse is under twenty-one years of age. 4. The spouse notifies the peace officer that the spouse will drive the vehicle from the place of arrest to the driver’s home or other place of safety. F. The owner of a vehicle that is removed and either immobilized or impounded pursuant to subsection A, B or C of this section, the spouse of the owner and each person identified on the department’s record with an interest in the vehicle shall be provided with an opportunity for an immobilization or poststorage hearing pursuant to section 28-3514. This act may be cited as the “Support Our Law Enforcement and Safe Neighborhoods Act”. Police chased reporters away from the White House and closed Lafayette Park today in response to a gay rights protest in which several service members in full uniform handcuffed themselves to the White House gate to protest “Don’t Ask, Don’t Tell.” Gay Protesters Chained To White House Fence . This is a clear example of protecting Obama’s image. At least five people dressed in military attire chained themselves to a White House fence in protest of the military’s Don’t Ask Don’t Tell policy. Decorators used about 800 ornaments left over from previous administrations. The ornaments were sent to 60 local community groups throughout the country, and decorated to pay tribute to a favorite local landmark, then they were sent back to the White House for display. Landmarks include the Statue of Liberty, the Boston Celtics, Chicago’s Lincoln Park Zoo and the DuSable Museum of African American History. The official White House Christmas tree is lit with energy-saving LED lights. Six of the trees on display at the entrances of the East Wing, West Wing and North Portico will be replanted after the holidays by the National Parks Service. Chef Bill Yosses and his team personalized the annual white chocolate-covered gingerbread White House to reflect the first family’s first year in the White House. The Official White House Christmas Tree will be on display in the Blue Room. Michelle Obama and daughters Sasha and Malia got their first look at the 18-1/2-foot Douglas fir arrived on the traditional horse drawn carriage to the North Portico. From the Shepherdstown, West Virginia, farm of Eric and Gloria Sundback, the tree is 13 years old. The show is later renamed “The Oprah Winfrey Show,” expanded from 30 minutes to an hour, and begins national broadcast in 1986. Received the National Organization for Women’s Women of Achievement Award. 1987 February 9: Her much acclaimed episode from her show was aired from Forsyth County, Georgia, where no blacks had been allowed to live since 1912. Oprah won her first Emmy for best talk/service show host and best show. Bought her Chicago apartmet and her farm in Indiana. Her half brother, Jeffrey Lee, sadly died of AIDS. Appointed chef Rosie Daley to supervise a new and healthier diet. 1993 Hosted an interview with Michael Jackson which reached an audience of one hundred million. President Bill Clinton signed the National Child Protection Act which had been strongly supported by Oprah. Won an Emmy for Best Talk Show and Best Host for the second year in a row. During a show about mad cow disease, says “It has just stopped me cold from eating another burger!” Texas cattlemen respond by suing her in 1998, saying she defamed food and disparaged business. 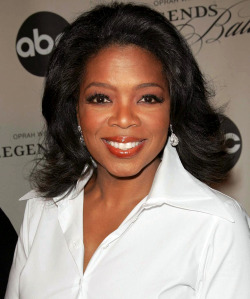 Oprah wins the subsequent trial. Introduces Oprah’s Book Club segment on her show, routinely creating best sellers of the selections. 1997 Formation of Oprah’s Angel Network encouraging people to make charitable contributions and volunteer work. Received a Lifetime Achievement Award from the Daytime Emmy Awards and an award for top talk show host. Starts Oprah’s Angel Network charity that has raised more than $51 million. 2002 In 2002 Fortune called O, the Oprah Magazine the most successful start-up ever in the industry. Became the recipient of the first Bob Hope Humanitarian Award at the 2002 Emmy Awards for services to television and film. Kicks off new season by giving each audience member a new G6 sedan donated by Pontiac. Oprah’s Christmas Kindness was made to draw bring attention to the plight of young African children affected by poverty and AIDS. Named as the greatest woman in American history as part of a public poll as part of The Greatest American in which she ranked in 9th place in the list of greatest Americans. Oprah & Friends, which begins broadcast the same year. While appearing on “Larry King Live,” advances the notion of an as yet undeclared Barack Obama as U.S. President. She later interviews Obama and his wife on her show and repeats her endorsement. The U.S. Senator from Illinois becomes a candidate and wins the 2008 Presidential election. Oprah currently lives on “The Promised Land”, her 42 acre estate in Montecito, California and also owns a house in Lavallette, New Jersey. 2007 Opens the Oprah Winfrey Leadership Academy for Girls near Johannesburg, South Africa, after investing $40 million. 2008 Announces deal with Discovery Communications to change Discovery Health Channel into the new OWN: The Oprah Winfrey Network, which will debut in 2010.